Kick off your visit on the 21st (Sun): see exotic creatures in open habitats at a safari tour and then head outdoors with Seven Fells Up. To find photos, ratings, other places to visit, and more tourist information, read our Akaslompolo holiday planner. London, UK to Akaslompolo is an approximately 10-hour flight. You can also drive. The time zone changes from Greenwich Mean Time (GMT) to Eastern European Time (EET), which is usually a 2 hour difference. Prepare for little chillier weather when traveling from London in April: high temperatures in Akaslompolo hover around 3°C and lows are around -4°C. Finish up your sightseeing early on the 21st (Sun) so you can travel to Turku. On the 22nd (Mon), test your problem-solving skills at popular escape rooms, then kick back and relax at Vepsa Island, and then kick back and relax at Ispoinen Beach and Sauna. To find traveler tips, maps, and other tourist information, refer to the Turku online journey planner . Do a combination of shuttle and flight from Akaslompolo to Turku in 5.5 hours. Alternatively, you can do a combination of shuttle, flight, and train; or drive. Traveling from Akaslompolo in April, expect nights in Turku to be about the same, around -1°C, while days are a bit warmer, around 9°C. Wrap up your sightseeing on the 22nd (Mon) early enough to take a train to Tampere. Start off your visit on the 23rd (Tue): enjoy the sand and surf at Rauhaniemi Beach, then soothe aching muscles at some of the top local wellness centers, and then have fun at Pyynikki's Swim Hall. Get ready for a full day of sightseeing on the 24th (Wed): kick back and relax at Riihiniemen Uimaranta, then identify plant and animal life at Hatanpaa Arboretum, and then test your team's savvy at popular escape rooms. For ratings, other places to visit, traveler tips, and other tourist information, you can read our Tampere driving holiday planner. Traveling by train from Turku to Tampere takes 2 hours. Alternatively, you can drive; or do a combination of flight and train. In April, daily temperatures in Tampere can reach 8°C, while at night they dip to -1°C. Finish up your sightseeing early on the 24th (Wed) so you can go by car to Kotka. Kotka is a city and municipality of Finland.Kotka is located on the coast of the Gulf of Finland at the mouth of Kymi River and it is part of the Kymenlaakso region in southern Finland. Start off your visit on the 25th (Thu): step off the mainland to explore Varissaari - Fort Elisabeth, then kick back and relax at Beach Mansikkalahti, then take a stroll through Linden Esplanade, and finally step off the mainland to explore Lehman. For photos and other tourist information, refer to the Kotka trip planning site . You can drive from Tampere to Kotka in 3 hours. Another option is to take a bus. Expect a daytime high around 8°C in April, and nighttime lows around -1°C. Finish your sightseeing early on the 25th (Thu) so you can drive to Helsinki. Get outdoors at Nuuksio National Park and Tapiola Golf. 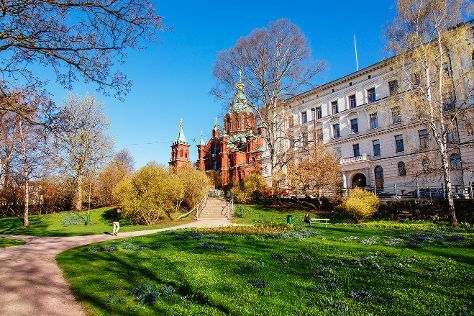 There's lots more to do: wander the streets of Katajanokka, take in the architecture and atmosphere at Rock Church, contemplate in the serene atmosphere at Kamppi Chapel of Silence, and learn about all things military at Sea Fortress Suomenlinna. For other places to visit, reviews, traveler tips, and other tourist information, use the Helsinki trip website . Traveling by car from Kotka to Helsinki takes 1.5 hours. Alternatively, you can take a bus. In April in Helsinki, expect temperatures between 9°C during the day and 0°C at night. Finish your sightseeing early on the 28th (Sun) to allow enough time to travel back home.